For the pen company of this name, see uni-ball. 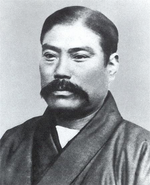 The Mitsubishi company was established as a shipping firm by Yatarō Iwasaki (1834–1885) in 1870. In 1873, its name was changed to Mitsubishi Shokai. The name Mitsubishi (三菱) consists of two parts: "mitsu" meaning "three" and "hishi" (which becomes "bishi" under rendaku) meaning "water caltrop" (also called "water chestnut"), and hence "rhombus", which is reflected in the company's logo. It is also translated as "three diamonds". During the Second World War, Mitsubishi manufactured military aircraft under the direction of Dr. Jiro Horikoshi. The Mitsubishi A6M Zero was a primary Japanese naval fighter in World War II. It was used by Imperial Japanese Navy pilots throughout the war, including in kamikaze attacks during the later stages. Allied pilots were astounded by its maneuverability, and it was very successful in combat until the Allies devised tactics to utilize their advantage in armor and diving speed. On November 28, 2018, the South Korea Supreme Court ordered Mitsubishi Heavy Industries, which serves as one of Mitsubishi's core companies, to pay 10 Koreans 150m won ($133,000; £104,000) in compensation for forced labor which it oversaw during the Japanese occupation of Korea. 18 family members of other victims of the forced labour which Mitsubishi Heavy Industries oversaw and who sued sometime before 2008 will also be awarded compensation as well. All 28 plaintiffs had previously filed a lawsuit in Japan, but had their lawsuit dismissed by the Supreme Court of Japan in 2008. Twenty-nine of the group companies participate in the Friday Conference (金曜会, Kinyō-kai), a luncheon meeting of their most senior executives held on the second Friday of each month. The group began its tradition of monthly executive meetings in 1952, and over time the meetings became a venue for coordinating policy between the group companies. However, by the 1990s, this practice was criticized (particularly by non-Japanese investors) as a possible violation of antitrust law. Since 1993, the Friday Conference has officially been held as a social function, and not for the purpose of discussing or coordinating business strategy. Despite this, the Friday Conference has been a venue for informal cooperation and coordination between the group companies, most notably in bailing out Mitsubishi Motors during the mid 2000s. ^ Wilcox, Richard (9 November 1942). "The Zero". Life Magazine. ^ Jablonski, Edward. Airwar. New York: Doubleday & Co., 1979. ISBN 0-385-14279-X. ^ Hawks, Chuck. "The Best Fighter Planes of World War II". chuckhawks.com. Retrieved: 30 July 2015. ^ Young, Edward M. (2013). F4F Wildcat vs A6M Zero-sen. Osprey Publishing. p. 36. ISBN 9781780963228. ^ Thompson with Smith 2008, p. 231. ^ Mersky, Peter B. (Cmdr. USNR). "Time of the Aces: Marine Pilots in the Solomons, 1942–1944." ibiblio.org. Retrieved: 30 July 2015. ^ Angelucci and Matricardi 1978, p. 138. ^ "Mitsubishi Materials apologizes for using U.S. POWs as slave labor". Reuters. 20 July 2015. Retrieved 19 July 2015. ^ a b c "Mitsubishi payout ordered over WW2 labour". 29 November 2018 – via www.bbc.com. ^ a b c d "三菱グループの最高決定機関「金曜会」の知られざる権力構造と裏序列". Shukan Diamond. 25 January 2016. Retrieved 28 April 2016. Wikimedia Commons has media related to Mitsubishi.